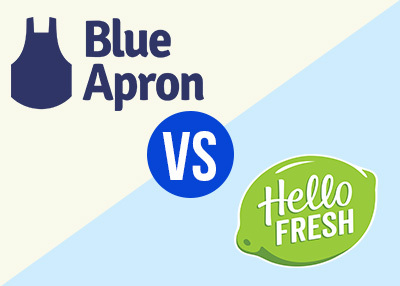 Hello Fresh vs Blue Apron: Which Meal Delivery Service Is The Best? It can feel like a full-time job just cooking three meals every day. Given the combination of preparing ingredients, doing the actual cooking, and then cleaning up everything, it takes most folks an hour and a half to do a home-cooked meal. In order to save some time in the kitchen, some busy households wind up resorting to getting takeout, ordering delivery, using pressure cookers and slow cookers, or just signing up for home delivery meal services. If you choose to do the meal delivery service thing for yourself, then you need to pick a meal prep delivery service that will work with your diet and lifestyle. Given how many meal prep service options are on the market right now, there are quite a few factors that you need to consider, such as price, dietary needs, taste, and delivery schedules. In order to help you learn just what some of the best meal delivery services can do for you, we’re doing a comparison of a pair of the most popular dinner delivered choices, and for the purpose of this home delivery meals review article, we are going to compare Blue Apron Meals and Hello Fresh Food Delivery. Easy recipes that taste great! Blue Apron vs Hello Fresh: Which one of these healthy food delivery services should you pick? This direct comparison between the two of them explains the ins and outs of each healthy meals delivered service, including taste, shipping, food quality, diet and food options, and prices, to help you make an informed decision when it comes to choosing the best food delivery service. Meal Delivery Plan Prices: It ranges from $8.74 up to $10 per serving. Fresh Food Delivery Dietary Options: They do have a plan for vegetarians. While HelloFresh does have some gluten-free ingredients in some of their individual meal options, they don’t have a fully gluten-free plan. On the other hand, they do let consumers know which of their meals are free of nuts, eggs, and gluten. There are also shellfish warnings where applicable. You get to pick your recipes, so this means you can pick out the meals you enjoy the most or just customize your meal selections to whatever dietary needs you currently have. Food Selection/Variety/Quality: This meal kit company has a whole team of dietitians and chefs that come up with 15 new recipes every week. The meals they come up with are typically healthy and balanced on a nutritional level. Accessing the nutritional information of these meals is easy. While Hello Fresh offers healthy meal options, it should not be treated like a Nutrisystem-type diet plan, as they emphasize good food, not dieting or weight loss. But we all know that eating healthier can help us with our weight loss goals, as diet is 80% of the battle. Consumers can customize their Classic Plan by picking a “fit preference” which can incorporate healthier meals in the neighborhood of 650 calories. Consumers can also pick out preferences like quick meals, things free of shellfish, or various options where meals might involve new cooking techniques and ingredients. On the HelloFresh website, the company claims that they emphasize ingredients which taste and look the best, and they try to use regional suppliers for sourcing most of their ingredients. Not everything is organic, however. Packaging/Shipping: Like most meal prep companies, Hello Fresh makes the assumption that consumers will already have some things on hand, including salt and pepper, butter, oil, and sugar, so those ingredients aren’t included in their pre made meals boxes. The ingredients and foods they do include, as part of their meal prep near me service, are preportioned for every meal individually, with dairy and meat products put inside cooling materials. Every meal also has a recipe card that has very simple steps to follow, as well as an ingredient list and nutritional information. Hello Fresh doesn’t charge for its shipping, and on delivery days, the boxes arrive inside a 12-hour window from 8 in the morning until 8 at night. Meal Preparation/Taste: We tried a few recipes, which were easy to make and tasted great. They took between 30 and 40 minutes to make, including reading all the instructions and getting the kitchen ready and finding stuff. Fresh Meals Delivered Prices: Meals range from $8.74 up to $10. Dietary Options: There is a two-person, all-vegetarian meal delivery plan. This prepared meals delivered to your door service doesn’t offer any other kind of specific dietary plans at the time of writing, although consumers can pick out what recipes they want, in an attempt to try and customize their order to fit into their dietary requirements. Food Selection/Variety/Quality: On the Blue Apron website, Blue Apron claims to source ingredients right from importers, farms, and family-run purveyors. They say that they take pride in working with over a hundred family-operated farms that use regenerative farming practices. Some of their ingredients are organic, yet in most cases not all of them. Blue Apron has four, five, or six meals you can choose each week, based on your diet meal delivery plan. Consumers get access to allergy and nutritional information ahead of time to make the right choice. Packaging/Shipping: Meals from Blue Apron show up using insulated thermal packaging liners with refrigerants in order to keep safe temperatures and fresh food. This healthy prepared meals delivered business also assesses its packing on a routine basis, so it can make the necessary adjustments for variables like weather conditions. However, they do recommend that their customers refrigerate all their perishables immediately. In each diet food delivery box, you’ll get ingredients that are pre-measured and also labeled for every meal, as well as a comprehensive recipe guide that has pictures and steps of instructions you can follow easily. You’ll even get the nutritional information about every recipe. What day your shipment will arrive is contingent upon the area you live in. Depending on where you’re located, your delivery options might vary. Meal Preparation/Taste: The dishes we tried were considerably tasty and delicious. We did find that some of the ingredients needed some more prep, so that made things take longer than expected. Blue Apron’s reviews from customers are mixed. A number of consumers don’t like the packaging or how they have to jump through a hoop or two in order to cancel the plan. On the other hand, there are others that love the food and the customer service. Blue Apron has a “very good” rating from Consumer Reports. For the most part, Blue Apron seems to excel in the area of taste. 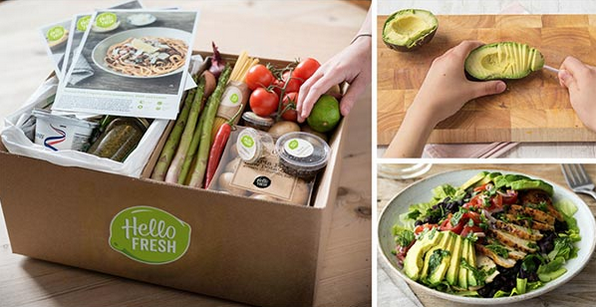 Hello Fresh has a trio of plans. The first is the Classic Plan of three or four weekly dishes for either two or four people. The second is the Family Plan of two or three weekly dishes for four people. The third is the Veggie Plan which can work well for two or four people with three weekly recipes. Blue Apron has a pair of plan options. Their Classic Plan feeds two people two or three meals each week, and their Family Plan works for four people two to four meals each week. Both meal prep services near me businesses offer subscription services, but you can optionally skip some weeks if you need to. They also both give you a bit of flexibility in terms of which delivery day you prefer. If you need to cancel the account that you have, Hello Fresh lets you do it online. Blue Apron makes you contact their customer support in order to turn off your account, but they do respond rather quickly. Hello Fresh has a pair of add-ons. The first one is a useful line of kitchenware, including storage solutions, knives, prep tools, and cooking ware. Their second add-on is a monthly subscription plan for wine; for $89, you get a half-dozen bottles of wine each month. You’re able to choose between white, red, and mixed. Blue Apron also has similar add-on options, like an attractive variety of wines you can match to every dish. There’s also a retail section, where you can find many types of cookware and other various kitchen supplies. Which Is The Best Prepared Meal Delivery Service For You? Both of these meal prep delivery services are great options to try, to see how food delivery services can help simplify your already busy schedule. But like all meal delivery companies, they have their own distinct audiences that like them for one reason or another. Blue Apron seems to work better for consumers that are passionate about cooking and that want to learn and experience new recipes and flavors in their kitchen. Hello Fresh on the other hand, who we would consider to be the winner of this comparison appeal more to consumers that are looking for very easy to cook recipes with great flavors and who are looking for a family size meal delivery service. Special Offer $60 Off Blue Apron! Special Offer $60 Off Hello Fresh!